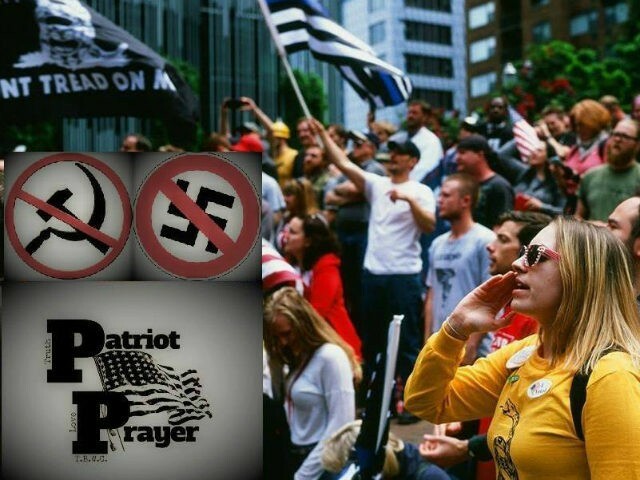 Organizers of the far-right “Patriot Prayer” group have canceled their planned and authorized “Freedom Rally” in San Francisco’s Crissy Field Beach scheduled for Saturday due to safety concerns. Gibson said Patriot Prayer is planning to hold a news conference instead. Meanwhile, a group of anti-Trump progressives plan to float a huge inflatable chick resembling the commander-in-chief across the San Francisco Bay. The inflatable chick will be carried across the bay and in front of the Golden Gate Bridge before the 2 p.m. start of the rally in an attempt to photo bomb the participants. “These alt-right Nazi sympathizers want to use the symbol of the Golden Gate Bridge to promote their cause and we’re not going to let them do it,” Danelle Morton of Vallejo, one of the organizers of the event with the chicken told the San Francisco Chronicle about those attending the Freedom Rally. An affiliated group had gathered several dozen bikers who plan to attach flags and run down 101 S to kick off the Patriot Prayer rally. The event, described in the permit application as a “free-speech” rally for about 300 people, runs from 2 to 5 p.m. Patriot Prayer has insisted it does not promote racism or bigotry, trying to distance itself from white supremacists who gathered in Charlottesville before an antiracism protester was killed, but the group’s past events have drawn people espousing hateful views. Several groups have reportedly organized counter-demonstrations on Friday and Saturday during the permitted rally. According to the Chronicle, San Francisco Mayor Ed Lee was disappointed the rally was allowed to proceed, despite the group’s First Amendment rights to hold a rally. Meanwhile, a group known as “No to Marxism” was reportedly denied a permit to hold a rally on Sunday, August 27, at the Martin Luther King, Jr., Civic Center Park in Berkeley. However, the rally may still take place. The Chronicle reports, “The loose collective known as antifa has pledged to meet those they call white supremacists in Berkeley, including violently, if they deem it necessary” on Sunday. Last year, left-wing radicals in Sacramento attacked approximately three dozen members of Traditional Workers Party (TWP), a right-wing neo-Nazi affiliated group that was demonstrating. Over 400 “anti-fascist” anarchists, who were organized by a far-left group called By Any Means Necessary (BAMN), carried out the attack. Just four months before that, a group of radicals attacked members of the white supremacist Klu Klux Klan (KKK) in Anaheim, California’s Pearson Park. Members from both factions were badly injured.